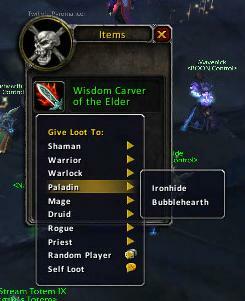 Sorts the loot targets by class instead of by group and adds random and self loot options. Just FYI, the recent "taint fix" commit has zero effect on tainting, positive or negative. The loop variables in a 'for' statement are inherently local to the loop. Declaring them before the loop only makes them visible past the loop's end. It increases visibility, not decreases it.